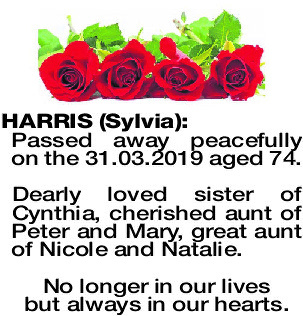 HARRIS SYLVIA Passed away peacefully on the 31.03.2019 aged 74. Dearly loved sister of Cynthia, cherished aunt of Peter and Mary, great aunt of Nicole and Natalie. but always in our hearts. On FRIDAY (5.4.2019) you are invited to celebrate the life of the late Sylvia Leslie Harris at a Ceremony to be conducted in the Bethany Chapel, 1 Prior Street, ALBANY commencing at 10.00am.